Please Note: Strict limit of One (1) cartridge per customer. any order for more then one will be canceled. One Cartridge: .455 Webley Automatic Mark I by Eley of England, produced in 1918, base case with "E.18 I" Head-Stamp and loaded with a non-magnetic, nickel coated FMJ (Full Metal Jacketed)projectile. Due to age the cases will have spots , you may wish to clean them. Sold as a collectible, may not fire, no returns. (1.) .455 Webley & Scott M.1904. This version was an experiential cartridge produced around 1904 by Kynoch Ammunition Company of England for British Army testing of the 1904 Webley & Scott self-loading pistol. 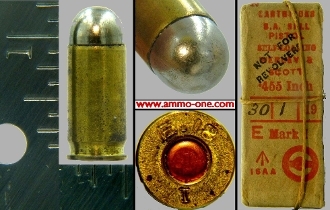 The only picture of this cartridge I can find was a jacketed soft point projectile, head stamped: “W&S 45 AUTO .455-K.” Case length was .880" to .887"
(2.) .455 Webley Automatic 1910. This version was produced in small lots by the Kynoch Ammunition Company of England from around 1904 to around 1912. The only head-stamp known was “W&S .AUTO 455-K." The only picture of this cartridge I can find had a full metal jacket projectile. One head stamp read “W&S .AUTO 455-K” by Kynoch. Case length was .921" to ..923"
(3.) Webley Automatic Mark I. This version was introduced in 1912 for use in the Webley & Scott self-loading pistol in the Royal British Navy, later in 1915 in the Royal Flying Corps and in 1919 in the Colt 1915 self-loading pistol by the Royal British Air Force. It was declared obsolete in 1927 by the British land forces. This version was available in many different head stamps, but a very hard item to find today. It is now obsolete for close to over 100 years. Case length was 1.223" to 1.224"
Also called: .455 Automatic Pistol, .455 Webley & Scott, .455 Webley Auto, MK I, and 455 Webley Self-Loading pistol.